Norton Creek Press, June 2003, 590 pages. Suggested retail price, $49.95. ISBN 0972177035. Genetics of the Fowl has been the constant companion of chicken breeders since it was first published in 1949. Chapters include the genetics of plumage, egg production, body size, disease resistance, and much more. The readable style of the book is a refreshing change from modern tomes written for an audience of researchers. Genetics of the Fowl makes fascinating and thought-provoking reading even for people who are not serious poultry breeders. For serious breeders, it’s indispensable. Greatly prized but long out of print, used copies of the original 1949 printing routinely sell for over $100. (Wise breeders know that this book gives them an advantage!) But our suggested list price is less than half of this. This book has been brought back by Norton Creek Press as part of its Norton Creek Classics line. The late F. B. Hutt was Professor of Animal Genetics at Cornell University. Hutt was quite a writer. In addition to discussing the nuts and bolts of how the individual genes work, such as the mechanism of rose comb vs. pea comb vs. walnut comb, he describes breeding strategy very clearly, and the various barriers to success. Because genes for plumage and such are straightforward and the techniques for getting what your want are clearly explained, no show breeder should be without this book. The last chapter, “Breeding in Practice,” describes all sorts of breeding strategies and discusses why certain things worked easily while others failed miserably, with plenty of examples. It really lays out the options open to breeders and the strengths and weaknesses of each. Anyone doing serious breeding will find this chapter alone to be worth the price of the book. But Hutt’s use of examples and his focus on turning genetic knowledge into successful breeding practice pervades the book. Hutt wanted results, not just understanding, and he’s good at getting both of them across to the reader. By the time you reach the end of the book you’ve been exposed to hundreds of examples of the breeding art. Forget about the lists of genes that you can get on the Internet; out of context, they’re meaningless. 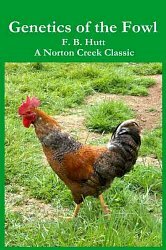 This book breathes meaning into chicken breeding. People have often asked me if a book first published in 1949 can really be fully relevant today, and let me tell you, this book is a treasure trove. When the same people ask me specific genetic questions, the answers are always there. Professionals love this this book. I’ve sold a number of copies of Genetics of the Fowl to poultry scientists, people who keep completely up to date on the field. They find Hutt to be fascinating and practical, just as you will. But the book can’t help you until you have a a copy. Buy it today!